Discussion in 'Community Announcements and Events' started by Touchfuzzy, Apr 22, 2018. 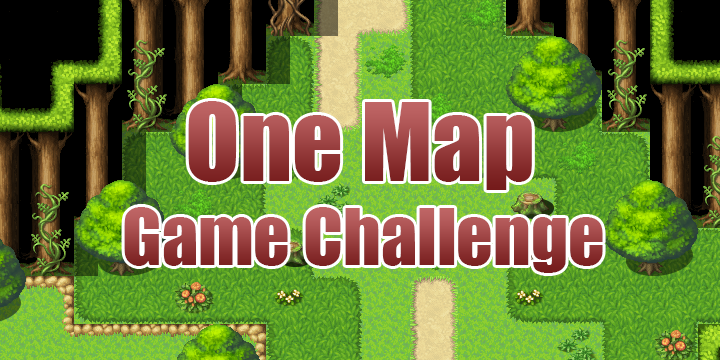 Welcome everyone, to the ongoing One Map Game Challenge! First of all, this isn't a contest. There are no deadlines, there is no judging, or voting. This is just a challenge. You can tackle this whenever you want, or not tackle it at all! So, one thing I've found a lot of people have problems with is finishing games. But why? Why do they have trouble finishing? Well, the truth is, it is two things: 1. It is a whole lot easier to say than to do, and 2. They try to make a sprawling epic from the start. Ok, I can't stop #1. But what we can look at is #2. A big thanks to @SmashArt and @hiddenone for a discussion in the status feed a while back, because this is based around a challenge they created for themselves to try to stop the Sprawl. Make a game. You can only use 1 map. You get only 10 events (total, combining map and common), 10 variables, and 10 switches. Plugins are allowed, but no plugins that are designed to work around these restrictions. Allowed engine: RPG Maker 2k/2k3/XP/VX/VX Ace/MV. And remember, stick to the spirit of the rules: No simulating multiple maps using complicated tileset switching or other such tricks. Events will of course probably have to do double and triple duty, but keep it to a minimum. The point is to not sprawl and to keep your story and game tight. There are no other rules. That is it. Finish whenever you want to, post it in the completed games section of the forums and then link it in the submission thread. All people who complete the challenge will be rewarded with an event-badge to celebrate their participation! And who knows, I might share a few of my favorites on our social media! Rabosion, watermark, atoms and 35 others like this. This seems like a fun challenge! I recently started experimenting with a pull/push blocks and pillars plugin, I could probably do something with that. starlight dream and Guiguimu like this. Chair. A really nice black chair. Comfy. Seems really fun! Great idea! Does it have to be a small map or can we have it the size we want? And can we change resolution or it's all default? I'll try to participate, especially because there is no deadline (makes life easier!). CallMeKerrigan, Philosophus Vagus, Touchfuzzy and 1 other person like this. Well, I made a game pretty similar to Craze's "Epic Monster Dungeon Explore! 2" and basically took the idea and put my spin on it. GUESS I WILL DO THE NEXT GAME IN THE SERIES NOW, EH!? Map size isn't an issue (though remember the point is to not make a sprawling game), and resolution changes fit under "plugins are allowed as long as they don't try to bypass the above"
I love this idea. but I wanted to try a new thing with eventing a character customisation. I suppose it would be against the rules to have a seperate map for the customisation event and then do the rest of the challenge on the other map? I'm probabaly just overthinking it now. lol. But I'll be doing this to try and get back into my game making groove! Interesting. What about menus, title screen? Are there restrictions on the size of the resources used? Or quantity? Self switches are part of the events themselves, so don't count for the switches restriction. Menus and title screen do whatever, same on resources. (though once again, don't try to use this to bypass restrictions. Technically you could make as many maps as you wanted using one map using tileset switching, but that isn't the point of the challenge). Nightblade50 Developer of "Delta Origins"
Wow, I'm going to do this. So please, nobody take that idea. NasranSalleh, CallMeKerrigan, Guiguimu and 1 other person like this. Just keep in mind it might take a bit for me to get the event badge together, as it hasn't been made yet . CallMeKerrigan, SmashArtist and Nightblade50 like this. Mystic_Enigma Cat? Bear? Don't really care! In MY world, you are not welcome in my world! Ooh! That...actually sounds doable. Maybe i'll give it a shot as well! One thing, though. Is there a limit of how large or small the map has to be? It wouldn't be a stretch to see folks making use of as much mapping as possible and creating something huge (Not like that's a bad thing, though.)! @Touchfuzzy Do troop events count into the event total? Is there a limit of how large or small the map has to be? I love the idea of this, finding clever ways to do a lot with a little. Count me in! Shadoux and starlight dream like this. Oh the idea's spinning around in my head! I'll go with no, as long as the troop events are about the fight itself, and not used to try to get around restrictions. I was only going to use troop events for various banter between the hero and the boss mid-fight, not to get around the restriction. Nightblade50 and Touchfuzzy like this. You gave me a clever idea. See ya'll in a few hours when I have something to show off. Oh I have such a great idea for this challenge. Going to spend the night storyboarding, unfortunately working out of town all week but once the weekend comes back I am going to hit the ground running with this. I'm totally taking this on for sure now! Hoping this'll be the first actual game I'll complete and show to the public! Wish me luck!! Edit: Extra question @Touchfuzzy ! Do common events count into the event count? GuanyuMaker, CallMeKerrigan and Touchfuzzy like this.